What could be more romantic than two songbirds singing their song of love from their perch? I made this card for the special man in my life who also happens to be my music partner. 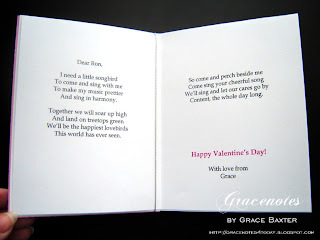 Inside is a very sweet little poem I wrote especially for him. 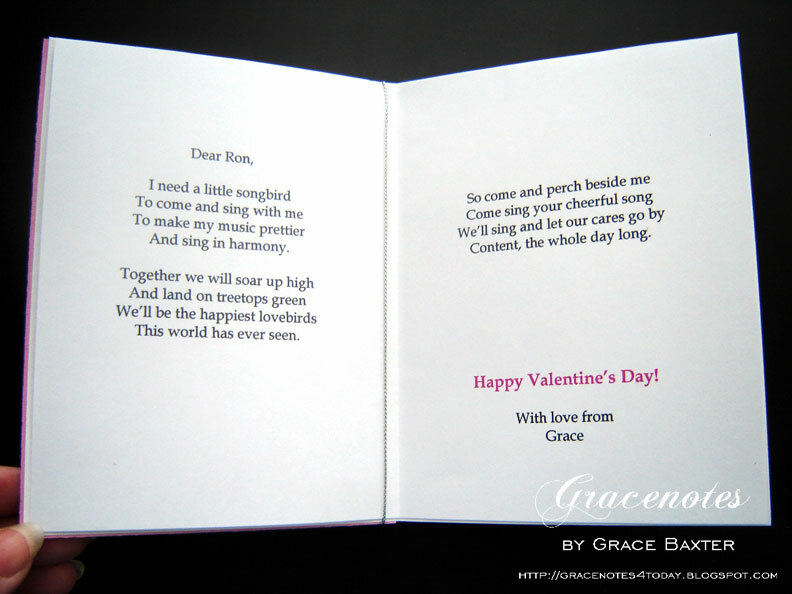 The title of the poem is also the sentiment on the card's front: "I Need a Little Songbird". I wasn't going to publish this but I am going to take a chance and trust that no one will steal it and call it their own composition. It may seem insignificant to some, but I have had other poems of mine pirated before. The recipient of this card is a very talented singer and pianist, also my singing partner. So the theme of this card was perfect for him. The card size is A2, my favorite size of 5-1/2" x 4-1/4". The colour scheme for this one was especially fun... pink, white, silver and black. Since the recipient is a male I didn't want the card to look too girlie. I found some wonderful pink argyle paper that has silver lines and small silver hearts at the juncture of the diamonds. 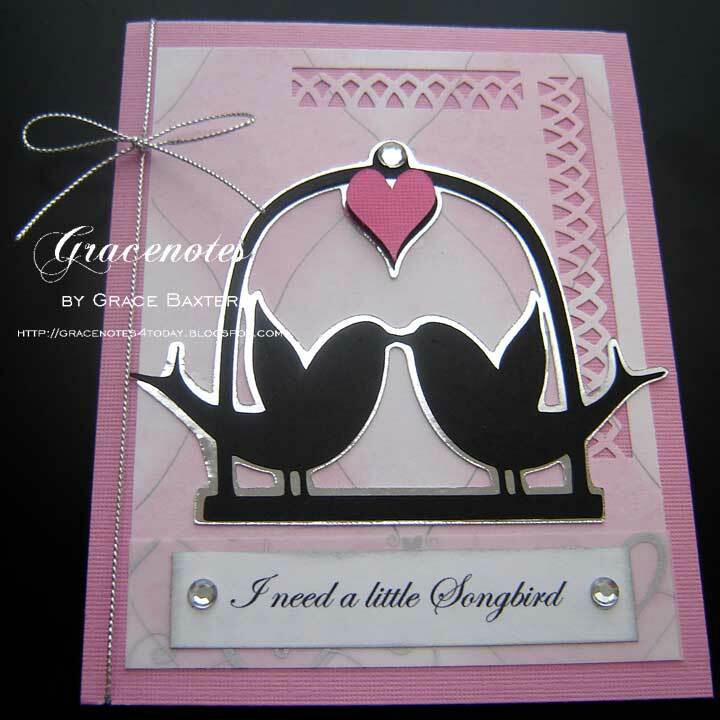 That gave me the idea to make the lovebirds black, shadowed in silver mirrored cardstock. I love the look! I also had a small piece of vellum with silver hearts that worked perfectly behind the sentiment banner. The sentiment was created on my computer. I always have fun finding just the perfect font to suit the mood or them of my cards. This one needed something script-like yet still easy to read. I used the MS lattice punch because it added a gardeny feel. This perch is somewhere in a garden. In case you haven't guessed which cardtridge I used... I think you'll be surprised! I know I was. Thanks for taking a look, and I'd love to hear your comments. Cartridge: Joys of the Season. Can you believe it? Love it! I WOULD LOVE TO BE YOUR SONG BIRD.